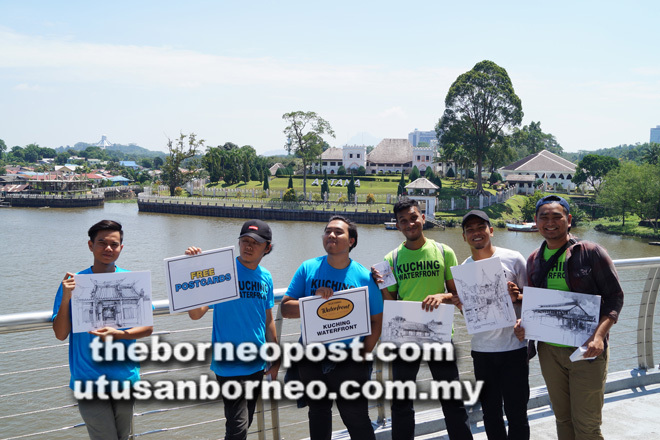 Staff of Kuching Waterfront Management hold up enlarged designs of the postcards. KUCHING: Tourists and visitors here for the Rainforest World Music Festival are in for a treat as the management of Kuching Waterfront has prepared a special gift for them to remember their visit to Kuching. According to the Kuching Waterfront Management, 4,000 specially commissioned, limited edition postcards would be given out free to tourists at the Kuching Waterfront this weekend (July 13-15). The postcards feature the Temple at Carpenter Street, Bishopsgate St, Brooke Dockyard, and the Old Court House. hopefully they can share it with their friends back home. It also encourages communication with relatives and friends by a personal hand written message rather than the impersonal electronic communications. The postcards which are sketches done by local architect and sketcher Wee Hii Min will be distributed by volunteers at Kuching Waterfront. This is the second time the postcards are distributed. A similar project last year received overwhelming response from the tourists.